Web Developer Salary Disclosed: How Much Do Web Developers Make? One particular question that comes up for a lot of people when they first think about a job in the field of web development is the salary. What’s an entry-level web developer salary? 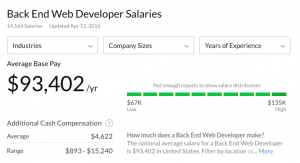 What is a back end web developer salary? Does it differ from a front end developer’s one? Just how are all of these different from a full-stack web developer salary? It’s completely normal to wonder about the difference in salaries of the different kinds of web developers. Whether you yourself are looking for a job and trying to decide which one is more worth the hustle, or you’re simply curious and are doing some research for research purposes only – the topic is an interesting one indeed! Today, we will cover the differences in salaries that different kinds of web developers make. Since these are also very region-dependent, we shall try to analyze their differences from a geographical perspective, too. 1.2 Front End, Back End, or Full Stack? 2.1 How Much do Entry-Level Web Developers Make? 2.2 How Much do Junior Web Developers Make? 2.3 How Much do Senior Web Developers Make? 3 Different Developer Types Matter! Before we go ahead and start talking about numbers, let’s briefly discuss some of the different kinds of developers that people may refer to when talking about web developer salary. First of all, we have what are called entry, junior and senior level developers. The entry-level web developers are those who have just started out doing actual web development work. Perhaps they’ve just finished university and got their first job, or maybe they’ve graduated from an online course and started working by recommendation. Whatever the circumstances might be, entry-level web developer salary is usually the smallest, at least when compared with other developers. This is pretty normal, though – the more experience they get, the more does their salary increase (as with any other job). Junior-level web developers are those who already have some commercial experience in the field of web development. These guys (and girls) have already worked on a couple of projects, and they could probably already tell you a thing or two about how this industry functions. 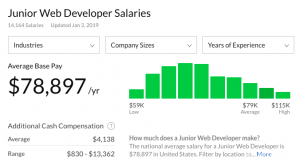 Junior web developer salary tends to be somewhere towards the middle – one could say that it kind of represents the average salary that web developers can expect to earn. Finally, we have senior web developers. A junior web developer transitions and becomes a senior one after about 10-15 years of hard work. That might seem like a super long period of time, but that’s the amount of experience that it takes. A senior web developer salary is the high point – these people make the most amount of money in this business. Front End, Back End, or Full Stack? Entry, junior and senior level web developers are also categorized into three different groups – front end, back end, and full stack developers. Front end developers are concerned with the visual side of the webpage. They work with graphical elements, interfaces and everything in between. Front end web developer salary is usually a tad bit lower than a back end developer’s one, since there’s not as much complex coding work involved. Back end developers are concerned with the actual code of the website. These people are responsible for the site’s health, so to speak – even though their work is usually hidden from plain sight, back end developers are to thank for the website actually functioning in the first place. Finally, we have the full stack web developers. This is the type of developer that can be considered a jack of all trades – full stack developers are basically front end and back end developers combined. These people work with both the visual side and the pure-back-end-coding side of the website. Needless to say, full stack developers make the most amount of money out of all of these three groups. 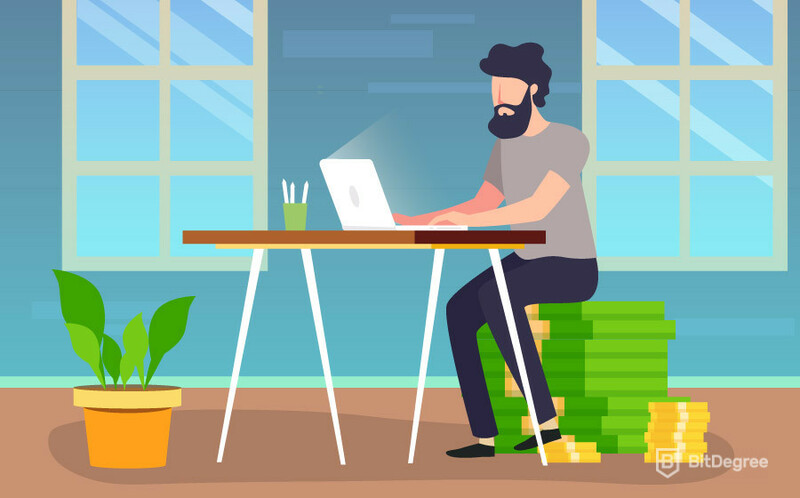 Now that we’ve covered all of the different groups of web developers, let’s get to the point of this tutorial and answer the main question – how much do web developers make? First of all, the numbers that I’ll mention ahead are very context-dependent. A web developer salary is heavily influenced by variables such as geographical location, size of the company, competence level, etc. Do keep that in mind while we go through the numbers. To keep things fair and simple, I’ll go through the web developer salary list referencing the three levels I’ve mentioned above – entry, junior and senior. So, without further ado, let’s begin. How Much do Entry-Level Web Developers Make? As I’ve mentioned above when talking about the entry-level web developer salary, these developers make the least amount of money when compared to the rest. Again, seeing that entry-level developers are usually those who have just started working in the field, that makes sense completely. Let’s take a look at an average salary of such a developer. Indeed.com estimates that, on average, an entry-level web developer salary should vary around the mark of $19,7 USD per hour (as of January 2019). With some quick math, and considering that an average work week in the US is made up of 40 hours, we can calculate that this turns out to be around $38,000 USD per year. This number (when taken into context) can be explained by a few key factors. First of all, entry-level web developers usually get paid significantly less due to their lack of experience in the field. A lot of the time, the jobs that they work require less skill and are more educational than anything else. Furthermore, entry-level developers are often managed and curated by their senior colleagues. It should also be mentioned that thy type of development that an entry-developer belongs to can also impact the potential salary. Front end entry-level developers will, statistically, make less than full stack web developers, even on the entry level. Now that we’ve covered the entry-level web developer salary, let’s move on to junior developers. 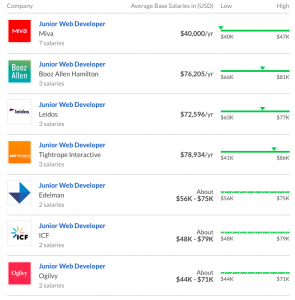 How Much do Junior Web Developers Make? According to Glassdoor.com, a junior web developer salary is estimated to be around $79,000 USD per year. As you can probably immediately tell, this is more than double the amount that entry-level developers get paid. This shouldn’t come as a surprise, though! Junior web developers are usually seen as those people who have already cemented their career paths, and all that they need now is experience. Furthermore, seeing that a “junior web developer” can be anyone from a year up to 15 years of experience in the field further explains the huge pay gap! A junior web developer salary is also heavily reliant on the company that the developer chooses to work in. While some companies value these developers and offer them an above-average pay, others choose to provide more experience and lessons, with a smaller salary as a result. Finally, let’s take a look at the senior web developer salary. How Much do Senior Web Developers Make? 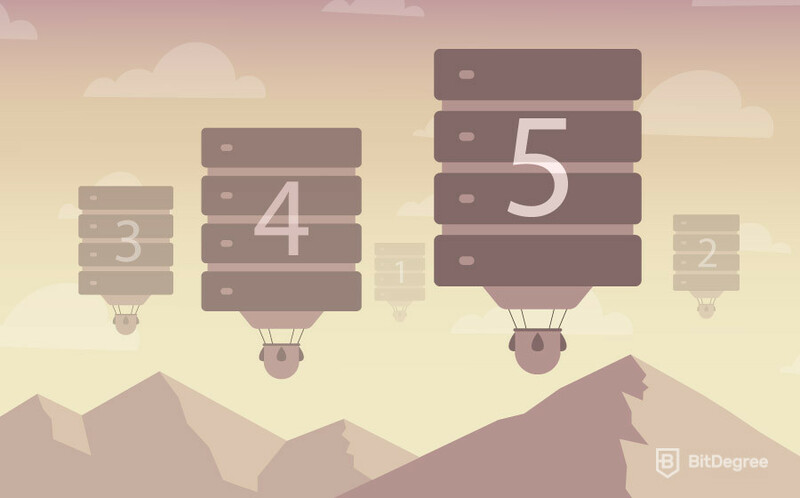 A senior web developer salary is often seen as “the top of the mountain”. Senior developers, depending on their type of expertise, get paid the most in the industry. Since they offer something (experience and skill) that is very sought after by a lot of companies, this makes perfect sense. In addition to that, senior web developers usually work in some of the more high-tier companies, which also attributes to their comparatively high salary. An average salary of a senior web developer is somewhere in the range of $103,200 USD per year. This equates to be roughly $8,600 USD per month. This is quite a big leap from the junior web developer salary, but is also completely understandable. With all of the three levels of web developers covered, it’s important to stress another huge factor in the difference of web developer salaries – the type of development. All three types of web developers (front end, back end and full stack) make different amounts of money, in spite of their skills and expertise. 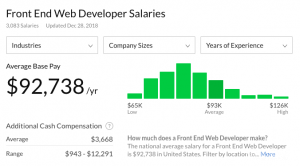 Since full stack development requires the most amount of time and skill put into it, a full stack web developer salary will almost always be higher than, let’s say, a front end web developer salary. 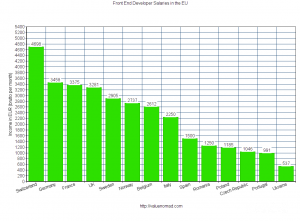 Front end web developers make around $92,000 USD per year. In comparison, a back end web developer salary is estimated to be around $93,000 USD. Even though the difference is almost insignificant, back end developers tend to make a little bit more since there’s more coding work involved. A full stack web developer salary averages at around $113,600 USD per year. Even though this is a significant jump from the front end or back end web developer salary, it is easily justifiable by the amount of skill that a full stack developer has to possess. When talking about the salaries of web developers, it should also be mentioned that they are almost always region or country dependent, too. Even though all of the salaries mentioned in this article are US-based, we should take a look at what a front end web developer salary looks like in Europe. As you can probably clearly see for yourself, there’s a completely different range of salaries when observing the above-presented graph (provided by valuenomad.com). It goes all the way from a yearly pay of around $65,000 USD in Switzerland to a staggering $7400 USD in Ukraine (all the amount are converted from EUR to USD with a 1:1,15 ratio). This just goes to show how different and variable-dependant web developer salaries are. Somethings that often go unnoticed when talking about web developers and their salaries are the other perks and benefits that this profession offers. First of all, web development is widely accepted as one of the most promising specialties that a person can choose. Since technology is constantly advancing and moving forward, more and more companies choose to hire web developers to further their reach and push the boundaries of amazing websites and web applications. It’s very unlikely that a day when web developers are not going to be needed will come any time soon. Since web development is one of those jobs that are usually offered by newer and internationally-established companies, there can be many more perks involved than just a great salary. These companies, more often than not, offer employees great working conditions (whether a beautiful, modern office or the ability to work from home), constant teambuilding activities, all-expenses-paid traveling to worldwide conferences and seminars, paid holidays, birthday goodie bags, and so much more! Even though these are often the things that get missed or excluded from web developer job conversations, they do add up to create awesome working conditions with extra benefits. It should also be mentioned that in the field of web development, there’s almost no limit to just how much you can improve and grow as an expert of your skill. Every single day may offer new and different challenges! If you constantly work hard and improve, your salary won’t stop growing. As a web developer, you also have a lot of opportunities to do some freelance work on the side, which can bring in some additional revenue, too. At this point, you should now have at least some idea of just how much do web developers make. Let’s have a quick recap. Out of the three types of web developers, full stack developers make the most amount of money per year. This is because they use the combined skills of both front end and back end development in their everyday work tasks. So, a full stack web developer salary is something that a lot of people strive to reach. Entry-level web developers make the least amount of money per year, since they are basically just starting out with this career path. As opposed to that, senior web developers are usually some of the most valued people in the company, with their salaries significantly reflecting that. It’s difficult to give a straightforward answer of just how much do web developers make, since the field is very diverse in both skill level and specialization of choice. Also, a salary that a web developer can expect to make is super region-dependent. I hope this article was useful to you, and that you found the information that you were looking for!